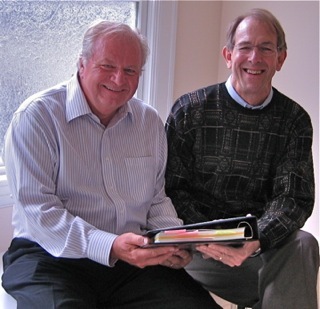 Mickey Mantle and Ron Lichty, two software industry veterans with over 70 years of combined experience, have crafted a book that will help any software manager be more successful. 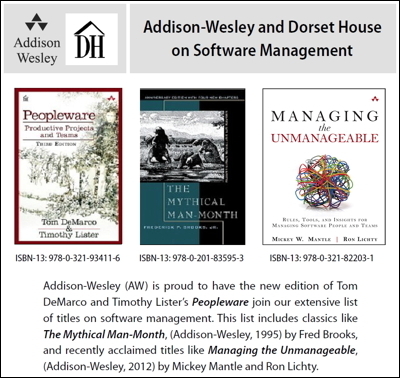 Having spent their careers developing software, leading software development projects, and managing programmers and teams, they have now distilled their experience into a book that every beginning programming manager should read and have on their bookshelves for reference. 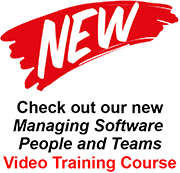 It’s a book that will also help executives who struggle sponsoring projects dependent upon software success – CEOs, COOs, CTOs, and others – understand the craft of software development and the intricacies of how to manage software people and teams to deliver software projects successfully. 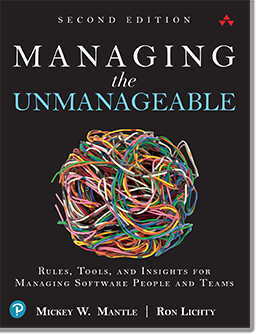 This book will help any software manager get a handle on their own unmanageable challenges. The book delivers dozens of tools the authors have collected or created over the years to help manage programmers: they share their sample job descriptions, interview summaries, interview questions, goal setting templates, developer skills inventories, code review guides, sample project workbooks, and many other tools that will save managers hours and days of time and effort. The authors share, in nine chapters, their hard-won experience gained from programming, managing and delivering software spanning two managerial lifetimes of companies and situations. The insights are sprinkled with anecdotes from their experience as well as rules of thumb and nuggets of wisdom they gleaned from their gurus.